The grass is getting pretty long around the edge of the local playing field at the moment. We often cross, to reach the woodland on the other side, and there’s a fairly well trodden path, which is handy in the mornings when the grass is wet with dew and I’m wearing shorts! The dogs however will always grab a blade or two for a munch, if I’m not paying enough attention, they’ll even try and have a feast! 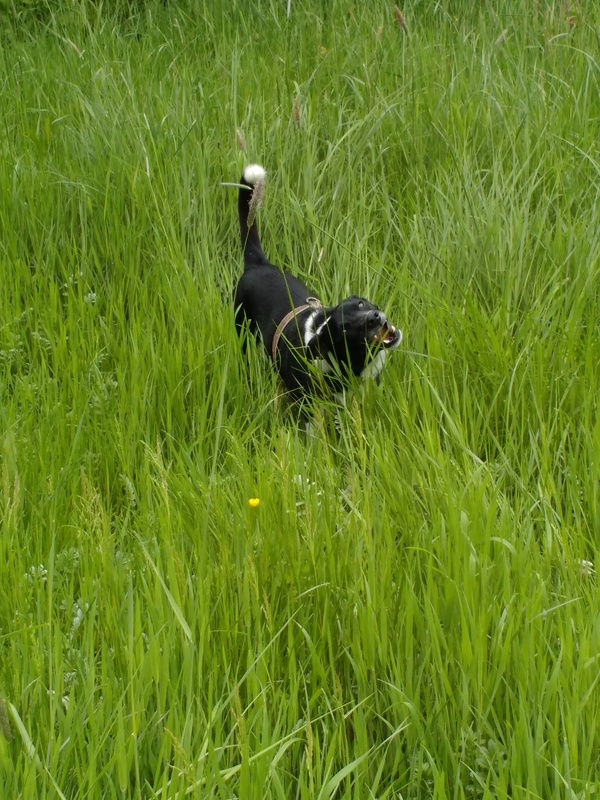 This entry was posted in Dog, Dogs, Wilson's Story and tagged dog walking, dogs, grass, walking. Bookmark the permalink. Our cats like eating grass, as well. Apparently, it helps them with fur balls. This time of year, along with the tall grass we get ticks, as well. Do you need to watch for ticks where you are? Hi David, I think the dogs do it for the same reason – as an aid to digestion. Yes we get ticks, and some years seem worse than others, not too bad this year so far. Both out dogs wear a flea collar however, so it’s not too much of problem, although I am wary of the chemicals in the collars as well.